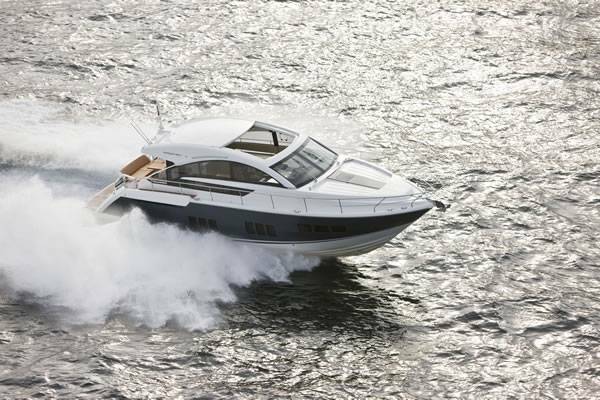 In their Targa 50, Fairline are reversing the trend of recent years. The model this boat replaces, the 48, had the master cabin amidships; the 50 has it forward – to the benefit of habitability. The rationale for the move to amidships was there was more beam there, it was a lower motion part of the boat, and you did not hear wave slap at anchor. 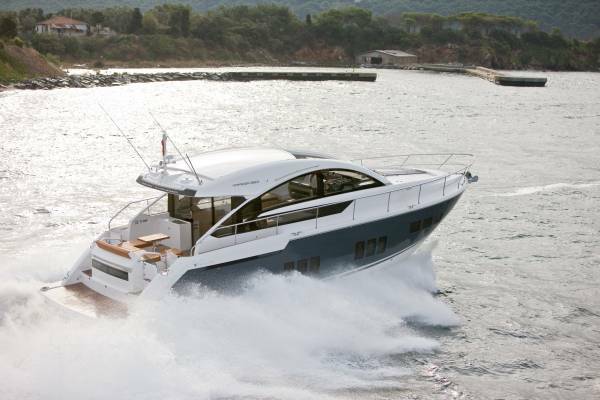 Fairline’s reason for their now general return forward is that you can put more headroom there, it makes better use of the deck space, it is further from possible generator noise, the motion consideration is effectively a non-starter because only the largest power boats regularly travel overnight, and insulation and design detailing have removed the slap. A cunning insulating feature here is a coffer dam ahead of the forward bulkhead that houses the fenders and provides an air gap. The cabin is habitable all right, with a vast bed, masses of storage and plenty of floor space. Headroom is indeed much greater than a mid cabin’s, and the whole space is better lit: as well as rectangular windows on both sides, there is a central overhead glazing band – with a blind of course. 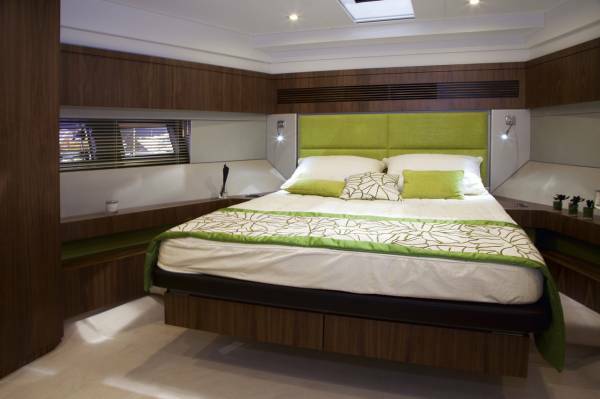 A pair of twin cabins now share the midships space, although they can also be configured as doubles. These cabins are large, mainly because so little space below is given up to passageway. A semi-spiral stairway has enough deck area at its foot to turn right and enter either twin cabin, or left to the main cabin with the minimum of movement. A pair of bathrooms flanks this lobby, one shared, one en suite and virtual mirror images. There are plenty of people who feel space and design time lavished on bathrooms is never wasted; those people would be pleased here. If my wife ever saw them I would be up for a remodel at home. The saloon repeats the spacious and well-lit theme. Above the weather deck level, apart from the roof the compartment is practically made of glass, and the roof contains a skylight. And if that is not enough, a sizeable percentage of the roof slides open to order. Under the opening and alongside the stairwell is a fore and aft settee built along the lines of a sun bed, and a dedicated sunbaker with agoraphobia could probably use it as such. The saloon has a big volume that is made apparently more so by a lack of clutter. Seating is confined to a single unit around three sides of a table to starboard, and a linear galley runs down the port side. 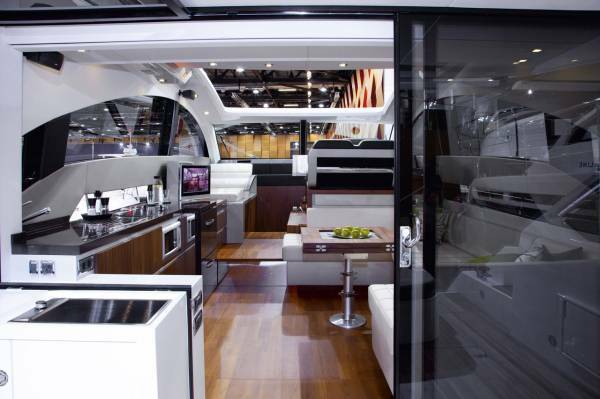 This leaves plenty of room for traffic, standing around socializing, and actually using the galley. 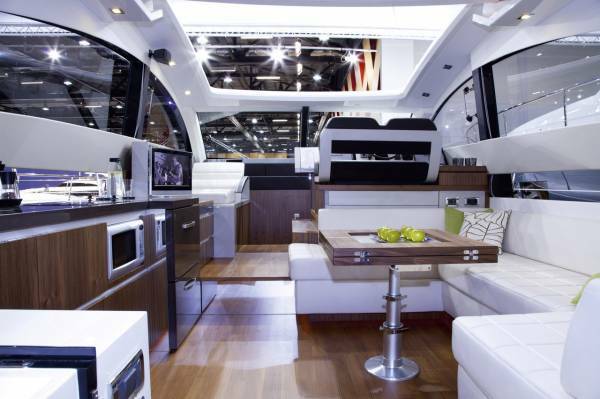 Its location makes the galley more likely to get serious use, with its easy access to both saloon table and the cockpit. The cockpit and rear platform have the kind of space Australians look for, with a good share of it shaded by hardtop. Below it, aft of the engine room, is the crew cabin that Europeans insist on in this class of boat. It has its own en suite and could well be to the taste of a teenager. Most Australians, though, are unhappy with the segregation, and the space can be fitted out instead as a storage and utility room – a home for washing machine and freezer. The platform aft is a buoyant part of the hull, with resulting benefits to trim. It also houses the tender launching system: the section of platform carrying the tender is lifted, extended aft and lowered to the water hydraulically. 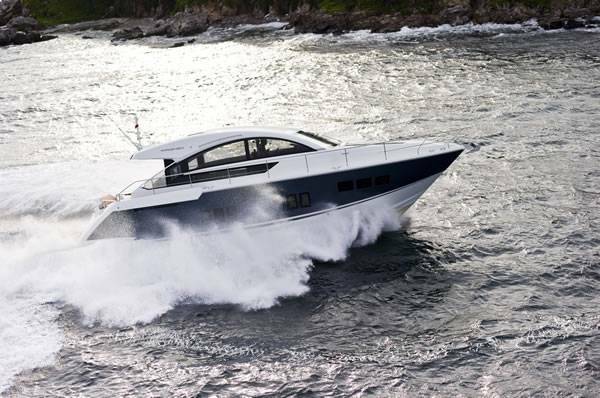 The Targa 50 is a very nippy boat: with the standard twin 670hp Volvos top speed is 32 knots. If you find that frightening a pair of 575hp Volvos drops it to 30 knots, or the thrill seekers can lift it to 33 knots with twin 710hp Caterpillars. They are controlled from a sumptuous station with endlessly adjustable twin seats, and similarly limitless controls for the extensive electrics.